This book defends a startling idea: that the age-old theological and philosophical problems of original sin and evil, long thought intractable, have already been solved. The solution has come from the very scientific discovery that many consider the most mortal threat to traditional religion: evolution. Daryl P. Domning explains in straightforward terms the workings of modern evolutionary theory, Darwinian natural selection, and how this has brought forth life and the human mind. He counters objections to Darwinism that are raised by some believers and emphasizes that the evolutionary process necessarily enforces selfish behavior on all living things. This account of both physical and moral evil is arguably more consistent with traditional Christian teachings than are the explanations given by most contemporary "evolutionary" theologians themselves. The prominent theologian, Monika K. Hellwig, dialogues with Daryl Domning throughout the book to present a balanced reappraisal of the doctrine of original sin from both a scientist's and theologian's perspective. Contents: Foreword, Monika K. Hellwig; Introduction, Daryl P. Domning. Part One The Historical and Theological Background of Original Sin, Monika K. Hellwig: The classic teaching on original sin. Part Two Why the Pre-Critical Understanding of Creation and Original Sin is no Longer Tenable, Daryl P. Domning: The Genesis cosmogony disproven: the universe is ancient and large; Life has evolved: how Darwinian evolution works; Objections to the Darwinian view of nature; No more Adam and Eve: science refutes monogenism; How suffering and death fit into evolution; Are we going anywhere? A static or cyclic universe versus an evolutionary universe. Response to Part Two, Monika K. Hellwig. Part Three Towards a New Understanding of Original Sin, Daryl P. Domning: Evolution and human behavior; Evolution and human ethics. Response to Part Three, Monika K. Hellwig. 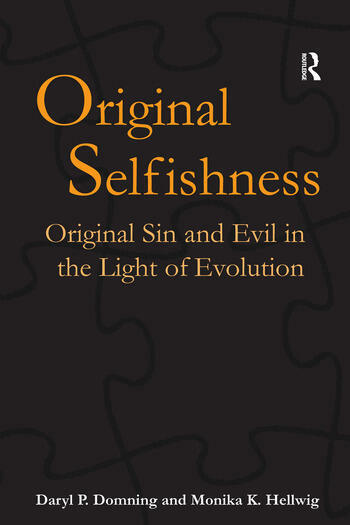 Part Four Original Selfishness: A Contribution to Evolutionary Theology, Daryl P. Domning: Adam and Eve reinterpreted; The meaning of salvation and the 'fall'; Reprise: what about suffering? ; Teilhard's synthesis and its fruits: a critique; Summary and conclusion. Response to Part Four, Monika K. Hellwig. Rejoinder, Daryl P. Domning. Bibliography; Indexes. Daryl P. Domning is a paleontologist, anatomist, and evolutionary biologist whose 100-odd technical publications over the last 30-plus years have dealt mainly with fossil and living marine mammals. Over the past decade he has developed (partly in response to the creationist challenge) an additional interest in the theological implications of evolution. A brief statement of his ideas on original sin (effectively, a summary of this book) was published in the Jesuit magazine America in 2001. He is a member of the science-religion faculty discussion group of the Washington Theological Consortium, which is currently the recipient of a 3-year Templeton Foundation Local Societies Initiative grant to develop a series of adult-education discussion guides on various science-religion topics and to hold a related series of public seminars. Because of the advanced state of this book project, it was selected by the group as the basis for their first public seminar (held in March 2003). Together with bible scholar and Washington Theological Union faculty member Fr. Joseph Wimmer, he has also abridged the book to form the first discussion guide in the projected series. He is also a regular participant in the annual Cosmos and Creation Conferences held at Loyola College in Baltimore, and a member of the Board of Advisors for that series. Dr Monika K. Hellwig was a prominent Catholic theologian, former President of the Catholic Theological Society of America, retired Landegger Distinguished University Professor of Theology at Georgetown University in Washington, D.C., retired President/CEO of the Association of Catholic Colleges and Universities, and author of numerous books. Dr Hellwig passed away suddenly while this book was in production. At the time of her death she was a senior research fellow at Georgetown University's Woodstock Theological Center, Washington, D.C.